It seems that summertime is the best time for a wedding. The weather usually cooperates by throwing some love in the air and making sure the special day is rain-free. If you are invited to a wedding this summer make sure you come with a unique gift in hand and not just the boring toaster. Why not stitch up a one of a kind gift for the happy wedding couple that they will treasure for a lifetime and will become a family heirloom? The patterns below are just a sample of the patterns out there. From funky to more traditional, there is a cross stitch for everyone. There are so many traditional ways to celebrate the bride and groom. You could get them antiques, or a piece of China, but fashions fade and more than likely, the platter or silverware you buy them will end up at the thrift store. 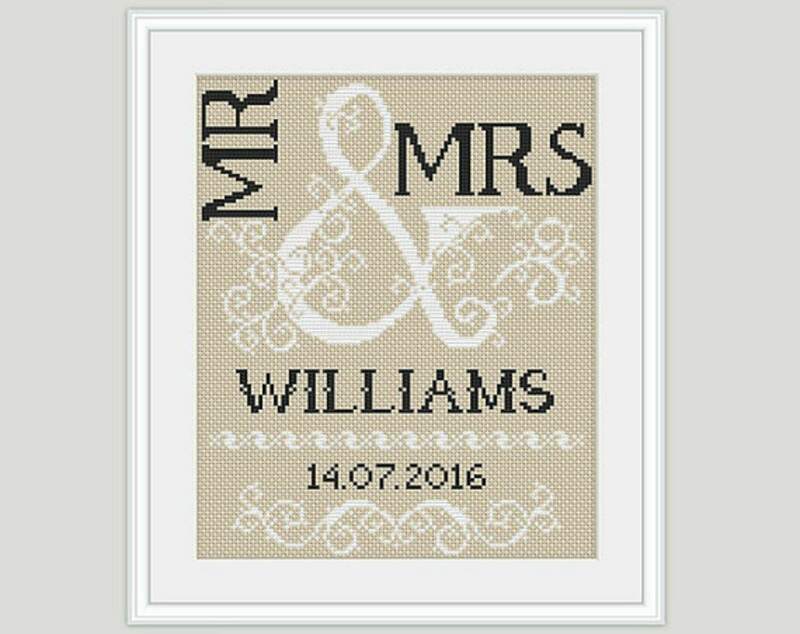 Instead of the same old boring gift, why not stitch an elegant cross stitch with the date they were married. Patterns Template creation is both elegant and traditional. If black and white ​are not in the color scheme, you can certainly use the colors of the wedding or the household. It is time to pledge your love, in front of all your family and friends to that one special person. That person who will love you through sickness and health, for better or worse. Why not remember the day with this fun and colorful pattern from Stitchrovia. Their shop is full of inspirational, bright and ​happy quotes. Remember the happy couple and how beautiful they look with this free pattern from Cross Stitch Pattern. You can include the date and names of the bride and groom as part of this pattern. You can also customize the color of the dress and play with the style. It's the big day. You want to pop the question but you want to do it in a spectacular way. Grab your floss and stitch up this geeky proposal. Attach the ring to the hoop and wait for the waterworks to start. StitchBucket has the best geek, nerd and fandom patterns for you to stitch up. 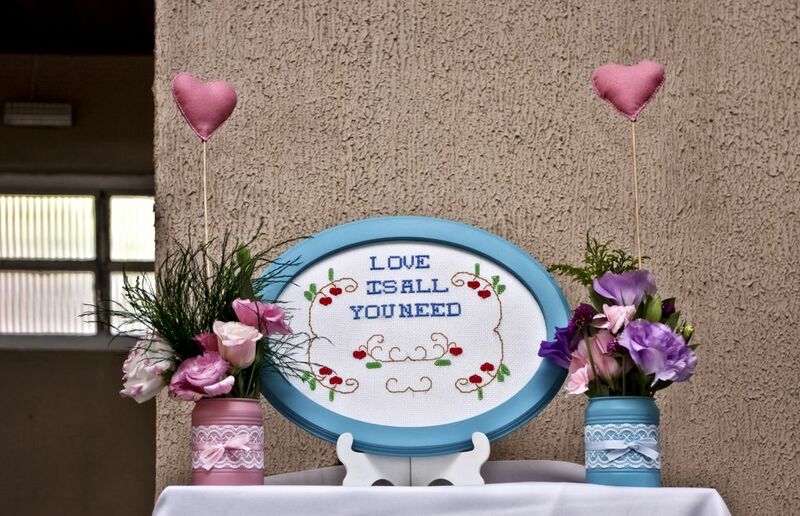 If the bride and groom are friends of cutesy and cartoon-inspired cross stitch patterns then this project by Cross Stitching.biz is perfect for the happy couple. The kissing cuties would look adorable framed or on a ring pillow. The wedding was amazing, the years have passed and you have settled into married life. While the day to day life may seem mundane, each morning you wake up next to the person you love and feel nothing but happiness. Show your true one that even after all this time you still love them with this Harry Potter themed cross stitch pattern from RHT Embroidery. You and your sweetie have settled on the big day. Share the announcement with a Wedding Cake Announcement card from Craft Foxes. Remember that special day and those that will follow with a customize cross stitch of you and your sweetie. No Basic Stitches will make a customized pattern of the two (or three, or four and a dog) of you that make you smile and jump for joy. This also makes an excellent wedding present. You can customize the pattern to the wedding outfits and include names and dates. Wedding rings are a symbol of the love that two people share. They do not need to be fancy, just a simple band. Celebrate the happy couple and their pledge of love with this free pattern from Cross Stitch Pattern.